There are a number of new varroacides currently in development by various parties—some fairly close to release. Some are synthetics; some are naturally derived, such as propolis or plant extracts, 2-heptanone or other pheromones, herbal extracts, or new ways of encapsulating essential oils. These, perhaps coupled with Dr. Peter Teal’s semiochemical varroa attractants will put new weapons at our disposal. Perhaps if enough effective miticides are available, beekeepers will actually be able to rotate treatments, rather than “wearing out” the effectiveness of each miticide by continued sole usage. One tall hurdle is of the cost of testing and registration. A company is only going to pony up the money if there is an expected net return on the investment. That is, if the company even considers our tiny industry to be a market worth addressing, tempered further by the potential likelihood of lawsuits by unhappy beekeepers, or bad press for killing bees or tainting honey. A further consideration for any company considering the investment in registration of a product, is whether the largest potential purchasers of the final product—commercial beekeepers—will even buy it, especially if they can purchase a cheaper version of the active ingredient off the shelf. There are inherent problems involved in the development of any new miticide for the control of varroa. The first is the issue of honey contamination. Pesticides can be roughly divided into two types, depending upon their solubility—they can either dissolve in water, or in oils. The chemical terms for those properties are “hydrophilic” (meaning “water loving”) or “lipophilic” (“fat loving”). Obviously, any pesticide that dissolves in water will also dissolve in honey, so that fact essentially rules out the hydrophilic chemicals (amitraz being an exception, since it degrades rapidly). That leaves the lipophilic miticides, which have the unfortunate tendency to dissolve into the beeswax combs. Then we have to deal with the margin of safety to the bees. Any varroacide must be substantially more toxic to mites than to bees, or its use would be moot. Ditto for toxicity to humans, since traces of it will likely show up in honey. Plus, any new miticide should not exhibit any deleterious synergy with residues of existing miticides in the combs (Johnson 2009). Any new varroacide will need to have a novel mode of action compared to existing synthetic varroacides, since mites have demonstrated their ability to quickly evolve resistance. 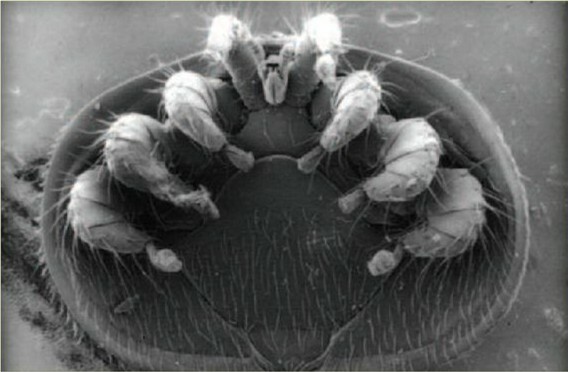 Existing miticides generally have a track record with other mite species, which may indicate how long an effective life they might be expected to have against varroa. I was recently speaking with Stuart Volby of Mann Lake Ltd. They have two new miticides in the works. The registration and production hurdles that they need to go through are staggering! They set up a production line for one product three and a half years ago for initial test trials (successful), yet are still waiting for the go ahead from a large pharmaceutical company that they’ve partnered with. Stuart laments that the wheels of the system turn far more slowly than do beekeepers’ needs. An important consideration in the future is that consumers are demanding more environmentally friendly pesticides, and “more stringent pesticide registration procedures, such as the Food Quality Protection Act in the United States, have been introduced. These new regulations have reduced the number of synthetic pesticides available in agriculture. Therefore, the current paradigm of relying almost exclusively on chemicals for pest control may need to be reconsidered” (Dayan 2009). Bottom line: we’ve already blown through the “easy” varroacides—new ones will likely be harder to find. One very effective “natural” miticide is formic acid. However, the devil is in the details of application—either requiring the handling of liquid formic acid, or dealing with the rim and temperature limitations of the MiteawayII® pad. David Vanderdussen, beekeeper and NOD Apiary Products Ltd CEO, showed me last year a gel formulation of formic acid (kind of like gummi candies) that he had been experimenting with for warm-weather application. He recently announced at Apimondia that the Mite Away Quick Strip™ has now been successfully tested and patented. If the product is as good as they say, this will be a major advance in varroa management! The claims for the strips are truly amazing: they kill varroa in the sealed brood, can be used at temperatures up to 92ºF, can be applied even during the honey flow, and require no rim nor removal of residue! And treatment takes only seven days. I’ll be reporting on the product as soon as I get some to test! Warning: the following section contains material that is not generally spoken of in polite company. To avoid rubbing U.S. beekeepers the wrong way, be assured that I’m not speaking of their practices—rather, I’m speaking generically of beekeeper practices worldwide. Beekeepers as a whole are a resourceful bunch, and commercial beekeepers are the epitome of innovative, rugged entrepreneurship. When varroa threatens their livelihood, they are sometimes placed in the ethical quandary of either following the letter of the law, or resorting to cost-effective “off-label” mite treatments that work when the approved products fail (or seem too expensive). There are a lot of agricultural miticides out there, and some of them exhibit relatively low toxicity to bees. Once a single beekeeper finds one that both kills varroa yet allows his bees to survive, anecdotal word spreads quickly through the grapevine, and pretty soon the miticide finds its way into others’ beehives, sometimes with disastrous results down the road. Oddly, beekeepers expect farmers to follow the axiom “The Label is the Law” with regard to pesticide application, and demand enforcement action should a farmer adjust the dosage, or use a pesticide off label. This smacks of holding farmers to a higher standard than beekeepers place upon themselves when they mix up off-label miticides. A little bit of knowledge can be a dangerous thing, and some clever beekeepers (in other countries, of course) have done some really dumb things with ag chemicals in their hives—especially with the long-lasting organophosphates and organochlorines (check the labels, boys). However, by trial and (sometimes painful) error, commercial beekeepers often come up with effective and cheap mite treatments.. Unfortunately, such off label treatments are generally not carefully formulated (such as by embedding them into slow-release plastic strips) to avoid wax or honey contamination, and the active ingredient (or adjuvants or degradation products) may accumulate in the combs. Then a positive feedback starts to take place. As mites become more resistant, beekeepers ramp up the dosages each season, and more and more miticide accumulates in the combs. At some point the “margin of safety” is exceeded, and the level of chemical needed to kill the mite reaches the point where it starts hurting the bees, too. When Doug VanGundy announced the imminent release of Hivastan at a convention a couple of years ago, a buddy sitting next to me elbowed me to write down the name of the active ingredient (not knowing that I had already thoroughly researched it). Sure enough, off-label recipes for the active ingredient were circulating even before the product was released, and some beekeepers inadvertently killed numbers of colonies during the learning process. Fer gawd’s sake, this product had been held up for years due to bee toxicity issues! If it were as easy as simply mixing some into Crisco, the company would have had a product on the market a long time ago! There are a number of issues involved in creating a miticide formulation to be used in bee hives. The dose of active ingredient needs to be evenly distributed to the mites in some manner. The simple act of mixing a product into a dispersant (such as oil or grease) can be problematic without industrial homogenization devices. The chemical also can’t reach toxic levels to bees during application, and shouldn’t get into the honey (imagine the press getting a hold of that one), nor leave a harmful residue in the combs. Additionally, if one starts with an ag product designed to be sprayed on plants, the product may have added emulsifiers or synergists which can be toxic to bees, or have unexpected side effects. I implore backyard chemists to always keep in the back of their minds that they don’t want to be responsible for any negative headlines about chemical-contaminated honey! As far as the future of beekeeper problems with agricultural pesticides, well, I hate to be the bearer of bad news, but the situation stands to likely get worse! Most climate prediction models (other than the sunspot minimum model) project a warmer Earth, with dry areas getting drier, and wet areas becoming wetter. Here in California, that means more spraying of fungicides, especially during almond bloom, when warm winter and spring rains favor fungal growth (I’ll cover some bee-related problems with fungicides in my next article). As things warm up, and wet summers get wetter, tropical diseases carried by mosquitoes will spread northward. Along with that will come cries from the public for more mosquito abatement. So much for safe water sources for our bees! Climate change will also greatly affect forage and the availability of irrigation water. Already, parts of the world and the U.S. are suffering from prolonged drought, and the Midwest may shift to more Dustbowl-like conditions. We see again and again how drought conditions are devastating to not only honey production, but to the simple survival of colonies over the winter. It is already harder to keep bees alive in some previously productive areas, and the future does not look any better. The June issue of California Agriculture is devoted to the effects that climate change are having on agriculture. 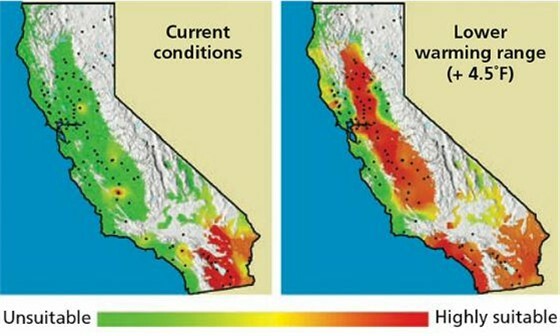 The maps below illustrate how the warming of California will allow a major cotton pest to extend its range. What does this have to do with beekeeping? Simply that every new agricultural pest will likely require additional applications of pesticides in areas or on crops where they were previously not applied. This does not just apply to farm pests, but also to wildland pests (pine beetles, borers, locusts). Pests of forage crops such as alfalfa, which used to be killed by winter cold, may now be able to survive and get in multiple generations each year, necessitating additional pesticide applications. Projected range expansion of the pink bollworm in California. At present, the pink bollworm’s range (left) is limited by winter frosts that kill dormant larvae. Rising winter temperatures would allow this major cotton pest to expand northward (right, red areas). Source California Agriculture (2009) 63(2): 53, by permission. If that’s not enough, the rising levels of carbon dioxide (CO2) (the increase of which is undisputed) affect protein levels in plants. Two papers (Bloom 2009; Trumble 2009) describe how at increased CO2 levels, plants produce less protein in their tissues, making them less nutritious to both humans, and to the insects that eat them. The insects compensate by simply eating more of the plant, which will require the use of more pesticides. Not only that, but some natural plant defense toxins (alkaloids and cyanogenic glycocides) are reduced in a high CO2 atmosphere. This even has an effect upon the transgenic corn and cotton which produce Bt proteins to kill caterpillars! Growing these plants in elevated CO2 resulted in a nearly 25% reduction of the insect-killing protein, which then allows the caterpillars to survive. Again, more pesticides will be applied. These effects of increased CO2 may indirectly affect bees, due to changes in plant toxins and pesticide use. However, it may well also directly affect bees by reducing or changing the proteins in pollen (Singer 2005). I have tried to understand why it is that bee yards that I’ve used for some 25 years can no longer support the numbers of colonies that they used to—now I question whether it has to do with decreases in the protein level of that critical ingredient for colony health—nutritious pollen. On the subject of pollen, “clean farming,” especially with Roundup Ready® crops has resulted in farmlands that are now virtual “deserts” as far as bee forage. The situation may get worse in corn-growing areas. Monsanto and Dow will soon be releasing SmartStax® corn–the first genetically modified corn that combines eight herbicide-tolerance and insect-protection genes. The approval by the EPA and CFIA is especially noteworthy because regulators agreed to reduce the “refuge area” for SmartStax from 20% of acreage (50% in the cotton belt) to only 5%. This means that completely weed-free fields may become the norm in the Corn Belt. On the flip side, the use of SmartStax may obviate the use of neonicotinoids to prevent rootworm damage. On the other flip side, no telling whether the GMO-derived insecticides in the new corn will affect bees negatively. Dang, it just gets so complex! 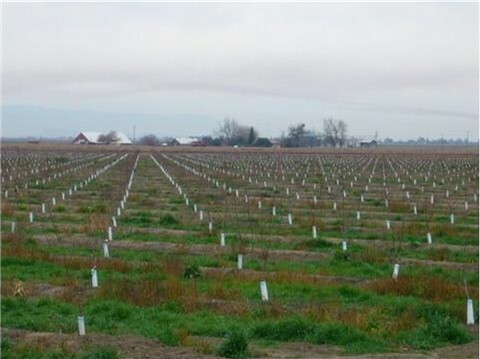 “Our projections showed that for many tree crops that now cover large areas within the Central Valley, climatic conditions will become less suitable and in many cases potentially prohibitive for production. Areas where safe winter chill exists for growing walnuts, pistachios, peaches, apricots, plums and cherries (>700 Chilling Hours) are likely to almost completely disappear by the end of the 21st century. For cultivars with chilling requirements above 1000 Chilling Hours, such as apples, cherries and pears, very few locations with safe chilling levels were found to exist today, and our modeling results project that virtually none will exist by mid century. Speaking of almonds, it is clearly amazing to me the influence that fear and rumor has upon beekeepers negotiating almond pollination rental rates! I’m hearing that some beekeepers have already laced up their running shoes in premature preparation for the “Race to the Bottom” in pollination pricing. Last season, a few guys at the last moment gave up loads of bees at desperation prices, and beekeepers and growers act as though a new benchmark price had been set. What they don’t take into consideration is that the rare extreme prices (don’t forget that some colonies also rented for $200), are mere outliers in the Big Picture. Let’s do the math. Some 1.4 million colonies are rented each year for almond pollination. Let’s say that 10 truckloads (less than 5000 colonies) of bees go at a fire sale price. Even though word of that lowball price spreads like wildfire, those colonies represent less than 4/10th of one percent (4 out of 1000) of all rented colonies! The vast majority still rented at near the market median, which last year appeared to me to be in the $125-$150 range for “field run” (supposedly) live colonies, with even better prices for strong graded colonies (in the $160-$170 range). The general buzz that I am hearing is that early contracts were going for about $10 lower than last year—but those prices were set when growers were in serious hurt due to low almond prices and unsure supplies of irrigation water. Some large beekeepers are currently not having trouble signing contracts at $155-$160. So let’s look at the supply side of the price equation. Be aware that the simple act of dropping prices $10 will remove some of the bee supply—hauling bees to California becomes less attractive as prices drop. The average cost of operating a colony of bees for pollination in the Pacific Northwest in 2007 was about $135 (Burgett 2007). It has since become even much more expensive to maintain a colony, what with excessive colony losses, protein feeding, and Nosema ceranae treatments, so there is little incentive for beekeepers to ramp up colony numbers unless rental rates are well in excess of the cost of maintenance. 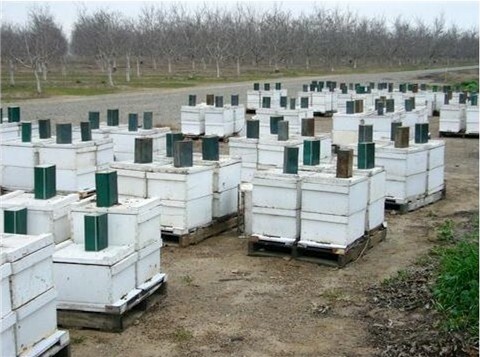 Preparing colonies for almond pollination often requires an investment in heavy feeding of syrup and pollen supplements, as well as freight, staging, and maintenance costs. This load of bees is being fed syrup prior to bloom in the North Valley. Honey prices at the time of this writing are sky high—encouraging some honey producers to avoid the midwinter hassle and simply stay home. After last year’s debacle, in which some Midwestern beekeepers who had hauled hives to California in November (in expectation that supply would be as short as “usual”) and then had the unfortunate experience of not finding a home for them (and as a result suffered great financial loss) some are feeling “once bitten, twice shy.” Those beekeepers may not be eager to gamble next year. A word to the wise: make sure that you have a signed contract before you haul bees to California! On the demand side, almond nut prices to growers did indeed drop earlier this year, but have recently risen to levels that they can live with. World demand for almonds is still expected to increase, especially in India, China, and Russia—three giant markets . Demand has been largely driven by the Almond Board’s marketing efforts—an example that should not be lost upon the honey industry. Just to put the value of the almond crop into perspective, it accounts for 12% of all fruit and tree nut income in the U.S.! In addition, new health benefits of almonds are continuously being discovered. 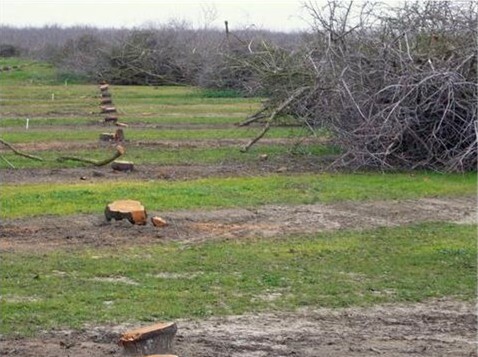 An older almond orchard being “pulled.” When nut prices drop, or water prices rise, growers are motivated to remove, and perhaps replant, less productive orchards. A young orchard just a few miles from the pulled orchard. These trees are a year old, and will start to bear a crop in their third year. To put the scale of almond plantings in California in perspective, there are more square miles planted to almonds than the entire area of the state of Massachusetts! Water is still an issue in California, but the forecast is for rain this year, due to the return of El Niño. However, some growers have pulled orchards of less productive trees, which means that the remaining acreage will be higher-yielding orchards, which demand either more colonies per acre, or stronger colonies. I suggest that almond pollinators take advantage of the Project Apis m. website (projectapism.org). Dan Cummings has started up an excellent “Almond Pricing” page, which will help beekeepers to understand the almond growers’ situation. As always, I expect both bees and beekeepers to rise to the challenges of the future. Looks like there will be no lack of such challenges. Next: The Future: Pesticides and Fungicides under Pesticide Issues. Dayan, F. E. et al. (2009) Natural products in crop protection. Bioorg. Med. Chem. 17(12):4022-34. Johnson, R, H Pollock, and M Behrnenbaum (2009) Synergistic interactions between in-hive miticides in Apis mellifera. J Econ Ent 102(2):474-479. Singer, BD, et al (2005) Increasing Amb a 1 content in common ragweed (Ambrosia artemisiifolia) pollen as a function of rising atmospheric CO2 concentration. Functional Plant Biology 32(7) 667–670. Trumble, JT and CD Butler (2009) Climate change will exacerbate California’s insect pest problems. Calif Agriculture 63(2): 73-78.